You can't get much farther from the coffee growing nations of Africa and Latin America than Oslo, yet the coffee culture here is as strong as a Monday morning espresso shot. Whether it's due to the climate or because it's a hell of a lot cheaper than booze, coffee is consumed by the bucket-load all over Norway. Not only is coffee incredibly popular, it's of an exceptional quality. Scandinavia is known for its light roasts and you will find them in all their glory in Oslo's coffee shops, where some of the world's finest beans are given the treatment they deserve. While you may be enticed by the comfort and familiarity of an international chain, I strongly recommend you visit one of the local stores for a more authentic and more delicious experience. Each Norwegian reportedly makes their way through an average of 7.2kg of coffee each year. It has been speculated that this habit evolved due to Norway’s ever-present strict alcohol laws and high taxes. It is certainly much cheaper to brew a pot of coffee than to open a bottle of wine. But I think coffee fills a bigger role than that. It suits the Norwegian climate wonderfully, perfect for waking the body and warming the soul on cold, dark days and for soaking up those long summer days where the sun lingers in the sky and never seems to set. The most common way to drink coffee in Norway is black and filtered. If you’re visiting a friend and you’re offered coffee, this is typically what they’ll serve. It might come from an electric coffeemaker or a French press. If that friend takes you on an oh-so-Norwegian walk through the forest, you might be served kokekaffe. Kokekaffe is coarsely ground coffee steeped in just-boiled water for a few minutes, a simple and delicious treat when out in nature. At most cafés you will find Dagens kaffe, literally “the day’s coffee”. It is black filter coffee, ready to be served. It’s the best value option for feeding your caffeine habit with a typical cup setting you back 25-35 NOK. 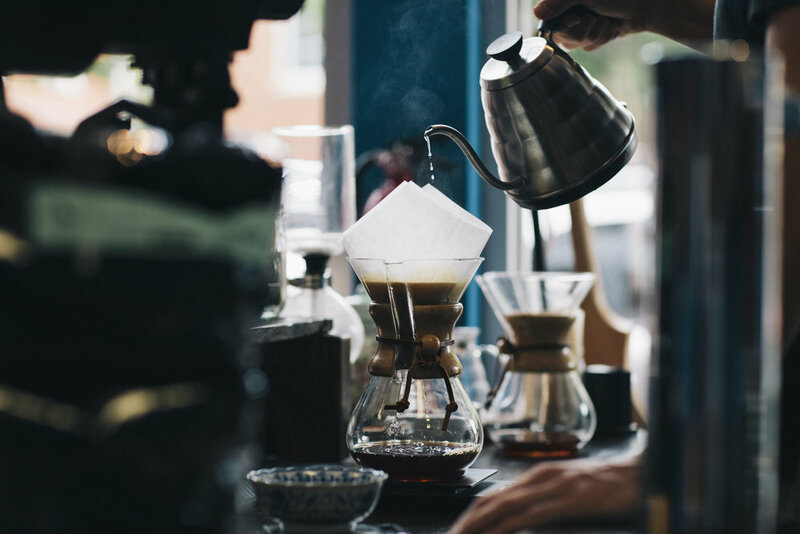 The penchant for filter coffee has leant itself well to the introduction of more modern manual brewing methods, like the Aeropress and fancy pour-over equipment (although Norwegians have been making pour-over for a long time). Some cafés, such as those I have listed below, will only offer filter coffee brewed manually. It is more expensive, but worth it if you’re a coffee lover, as the beans are often more delicate in flavour. Espresso-based drinks are available in every café as well and you will find excellent examples of espresso, cortado and cappucino from 20-40 NOK. It is possible to find even cheap coffee at convenience stores but I can't recommend that with a good conscience. The light roast has become the hallmark of Norwegian coffee. While bulk coffee roasters will roast coffee quite dark to hide imperfections and provide a consistent taste, the local roasters will often stop the roast much earlier. This allows the natural sweetness of the coffee to shine through and you can much more easily identify the characteristics of the coffee - both its merits and its faults. Much like with wine, it’s possible to identify flavours that have come from the local environment. That’s why you will often see coffees described as tasting of cherries, jasmine, caramel or nuts. Give your cup a couple of minutes to cool down for these flavours to really present themselves. As devastating as it is, Nespresso machines have made their way into peoples homes. While it may be an easier way of making a quick cup of coffee, it is actually quite expensive and poor quality. Coffee is fresh produce and should be treated as such. Large chains such as Starbucks and Espresso House have arrived in the last few years and while they do offer a comfy place to sit, their coffee is expensive and inferior to what you can find elsewhere. With so many lovely independent shops around, along with some solid local chains, it’s not hard to find a better cup and support the local industry at the same time. To get a taste for Norwegian speciality coffee, I’d recommend popping into any or all of Tim Wendelboe, Supreme Roastworks, Java, Mocca, Solberg & Hansen, and Stockfleths (a small chain). If you need something quick and easy, there are Kaffebrenneriet stores dotted all around the city.